In a prolific career spanning six decades, Charles Addams created several thousand cartoons, sketches and drawings, many of which were famously published in The New Yorker. But it was his creation of characters that came to be known as The Addams Family that brought Addams his greatest acclaim. Now The Addams Family comes to life in a new musical which will make it's world premiere in Chicago in November 2009. "...it's not just a matter of focusing the action on those seven characters (although Jackie Hoffman's Grandma and, especially, Zachary James' Lurch are underused), it's also about sticking more to those characters well-known traits. At this juncture, this show (book by Rick Elice and Marshall Brickman, music and lyrics by Andrew Lippa) pulls itself in new narrative directions so fast and so far, you don't get enough of a chance to enjoy the Addamses being the Addamses." "...The musical, which unites a most unlikely group of creative talents, demonstrates that such disparate artists can indeed become a fabulously functional theatrical family � one that looks and thinks and behaves just a little differently from any other, yet one whose artful originality and playfulness stays true to the Broadway �ancestors� in all the important ways." "...To its credit, the show doesn't ignore the Addams family's TV and film incarnations, so those expecting finger snaps, swordplay and tango dancing won't be disappointed. What's more, the show boasts a Broadway-ready score by composer/lyricist Andrew Lippa ("The Wild Party") that contains several gems including "Clandango," a rousing celebration of family unity; 'Happy/Sad,' a lovely ode to fatherly love; the made-for-cabaret 'Second Banana,' delivered by the charismatic Neuwirth as a Bob Fosse vamp, and the tuneful 'Let's Not Talk About Anything Else But Love.'" "...But the best thing the show picks up from its forebears--including Charles Addams's original New Yorker cartoons--is a great and humorous grace. Everything is done lightly, with a wink backed up by loads of craft, as when Kevin Chamberlin's charming Fester levitates and cavorts among the stars. Nathan Lane as Gomez personifies the general classiness of the thing: I don't think I've ever seen a human being look so absolutely at home on a stage." "...Composer Andrew Lippa has inched towards Broadway success for 15 years; now he'll finally have it. His tuneful pastiche of tangos, ballads, anthems and songs-and-dances even includes homage to the Addams TV theme song, to the audience's delight. There's a dash of John Williams action music here, a touch of John Kander strut there and some soft rock in between." "...The opening night audience rooted mightily for �The Addams Family� and likely a high percentage of the crowd left the theater well satisfied, a legitimate reaction considering how much talent was on display. But there is revising to be done, and hopefully Brickman and Elise are hard at work shoring up the storyline and getting Grandma Addams more stage time." 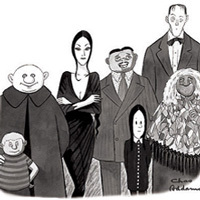 "...Respect for history and heritage are key among the Addams family values, as we're told in the opening number of the new musical based on Charles Addams' cartoons from The New Yorker magazine. So it is with the musical itself, which respects the conventions of the big Broadway musical as much as it does the heritage of Addams' cartoons. Though, as of the press opening of the show's pre-Broadway engagement in Chicago the two traditions don't always perfectly merge, The Addams Family delivers solid entertainment values in big Broadway style." "...The cast is perfection, led by Lane and Neuwirth as Gomez and Morticia Addams. No other actors could be more ideally suited to bringing these iconic roles to life. Physically and vocally they embody the ghoulish Addams guardians. The same praise goes to Kevin Chamberlin's impish Uncle Fester, more-or-less the show's emcee, and Jackie Hoffman's feisty, wisecracking Grandma. Both are comic geniuses and accomplished musical artists; Chamberlin brings down the house with his aerial ballet, 'The Moon and I.'" "...That familiarly freakish family has brushed up their voices, polished their dance shoes and ratcheted up the energy for a new, multi-million-dollar Broadway-bound musical. And if you�re a softie for a simple love story (with a twist, in both the narrative and physical sense) you�ll be pleasantly surprised by what they�ve done to musicalize this positively peculiar bunch." "... The largely admirable new musical based on cartoonist Charles Addams�s creations has a lot going for it, most notably director-designers McDermott and Crouch�s intimate understanding of Addams�s aesthetic and a cast to die for. The show�s creative team uses the familiar characters to tell a tale of the inherent compromises required by love (both familial and romantic) and the inevitability of change. The plot is macabre La Cage: Newly of-age Wednesday has fallen in love with a �normal� boy, and the Addamses welcome his white-bread parents for dinner; entropy ensues." "...It is so refreshing to see such a smart, well staged and thoroughly entertaining new musical that absolutely lives up to its hype. You laugh, you empathize, and love Uncle Fester and the Addams� clan. Get to the Oriental Theatre soon for this excellent holiday treat�you only have until January 10, 2010. Morticia and Gomez will treat you with macabre and Lurch will take your hat." "...Many shows have a great deal of hype prior to opening and then flee off to oblivion, or high school and community theater productions. The latest hyped show, "The Addams Family", a new musical starring Nathan Lane as Gomez Adams and Bebe Neuwirth as Morticia is a solid laugh filled, slick production that I sense will have several Tony Awards and lots of nominations. This wonderful new musical based on the characters created by Charles Addams with a book by Marshall Brickman & Rick Elice and some dynamite music and whimsical lyrics by Andrew Lippa is an adult evening of humor." "...For boomers who loved the finger-snapping show, The Addams Family is a must. Ditto for those who treasure any chance to see Lane and Neuwirth perform live. For the rest, there�s just not much there."